As you can see, the translation (copied exactly) leaves a little to be desired, but you at least get the idea. I still like the idea of a model company telling us about the vehicle we are about to build, both historically and its specifications. Some other model companies have dropped this service, and I think they are missing a golden opportunity to educate and promote their product. The kit is molded in A (2 identical sprues), B, C, and E plastic runners, a “D” photo-etch piece with 3 parts, and 2 “F” runners in a soft rubber-like vinyl. The box says 147 plastic “details”, 3 photo-etched “details”, and 22 gum elastic “details”. I’m not one to sit down and actually count parts, but as the kit has “length and link” tracks, they are probably correct in their parts count! It took me about 3 hours just to cut out the parts (as is my practice) and clean up the parts so that the construction could commence. 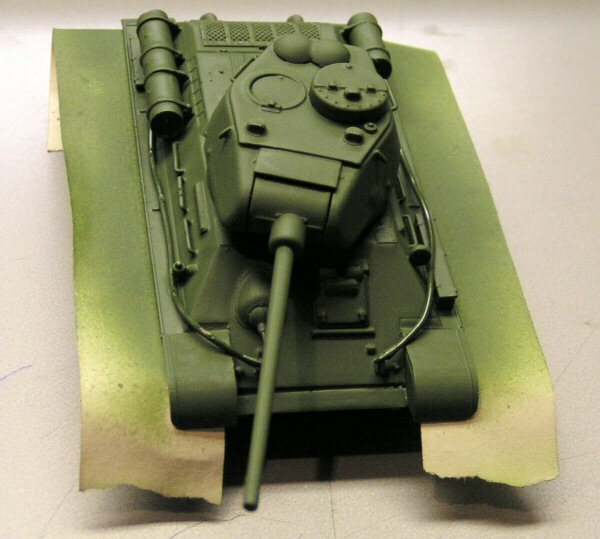 All plastic molding is done in green (fairly close to what I will use later to paint this kit) and the vinyl (they call “gum elastic”) is “tire” black and the photo-etch is brass. 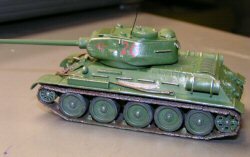 The directions outline what parts are not needed for this particular version and as they share many common parts, you need to keep them separate from any other T-34/85’s that you may have on the “assembly line”. 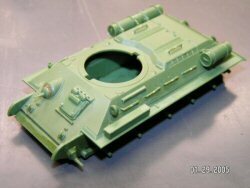 In assembly steps 1, 2, 3, and 4 you are instructed to build the bottom of the tank, the running gear and tracks. Assemble the wheels (4A, 5A & 2F x 2) as individual units, which when completed, should number 10 in total. By following the instructions, no difficulty should be experienced. As a tip: When putting the individual tracks “links” on the drive gear (parts 27A & 29A x 2) and the take-up idle-wheel (parts 9A & 11A x 2), be sure to follow the directions very carefully and use part 19A, then 20A, then 19A, etc. until you have the proper number for both front and back.I glued the individual links on these parts before attaching them to the chassis and actually letting the glue set up (I use a liquid glue – those using “super glue” won’t have to wait!). No difficulty should be experienced in completing the chassis. The next assembly steps, 5 and 6, complete the top of the chassis. Follow carefully and the parts go together very easily. Throughout the construction phase, there are amazingly NO options, so you can pretty well “barrel ahead” towards completion. 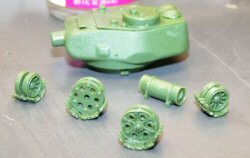 Step 7 is construction of the turret. When putting parts 151E and 150E together (turret halves) be sure to clean up the “splice” in the back as the real tank was “cast” and no visible seam would be there. I’m not real enamored with the 85mm main gun barrel (part 36E) in the kit, especially when trying to drill out the end. An after-market aluminum barrel would suit me much better, although if covered up with some cloth – tied on the end, to keep it clean as was sometimes done, would solve the plastic barrel dilemma. In step 8, the same comment on trying to drill out the engine exhausts (part 71A x 2) as was made above on the barrel. They are very small and difficult to center your drill. Use a very small sewing needle to start a “pilot” hole, and use a small drill that looks appropriate (I have them down to size #81, but by now, none are labeled in my drill stand!!). I drilled a small hole in the turret for the radio antenna. I use a nylon paint brush (I believe it is a 2 inch) for a “donor” for my antennas. I have had the same paint brush for years and have built several dozen tanks using its bristles for my antennas. I dry brush them after I’ve painted them the “base” color a lightened steel color. They are very flexible and do not break when moving the vehicles around – especially if you are taking your “pride and joy” to a show! Not being an expert on Russian WWII tanks and their tracks, all that I can say is “they look like T-34/85 tracks”. I am one that generally favors “link and length” tracks, and these seemed to go together without much problem. You “should” end up with a few extras (according to the directions). But, if you are like me and cut them ALL out, and in the process lost a few to the “carpet monster”, you have JUST enough when finished! With the wheels already a black color because of the vinyl “tire”, all that has to be done in the base painting and then the detail of rust, rust, and more rust for the track. There are three photo-etched parts. The largest piece is a rear deck grill for the engine. Roll it onto something long and round (like an X-acto hobby knife barrel) to get the right curve before super gluing it to the deck. The next largest piece is a cross-cut saw that mounts on the side of the tank with a little super glue. The final piece is some kind of a “flange” that goes on before the hull-mounted machine gun. This flange looks good once in place. All parts were easy to remove and attach to the kit. Well, here we have very little creative flare. Russian tanks were GREEN. I’m using Model Master Enamels, so the color used was “Medium Green”, FS 34102. Yes, I know the Russians didn’t use our FS system (which was developed AFTER WWII), but this “looked” right to me and with some dry-brushing and fading in, it looked just fine. I’m sure the “color police” will take me to task for this particular color, but I think it “looks right”! The tracks were link & length, so I painted them in my “usual” manner. I first brush on a coat of rust to both sides. After that is dry, I highlight them with steel. Then, after I’ve installed them on the tank, I flow in some acrylic based “dirt” to even them out. The vinyl tires (gum elastic per UM) was a new experience for me. They seemed to hold super glue fine and were “dirtied up” with the final brush and spray painting of the acrylic “dirt”. 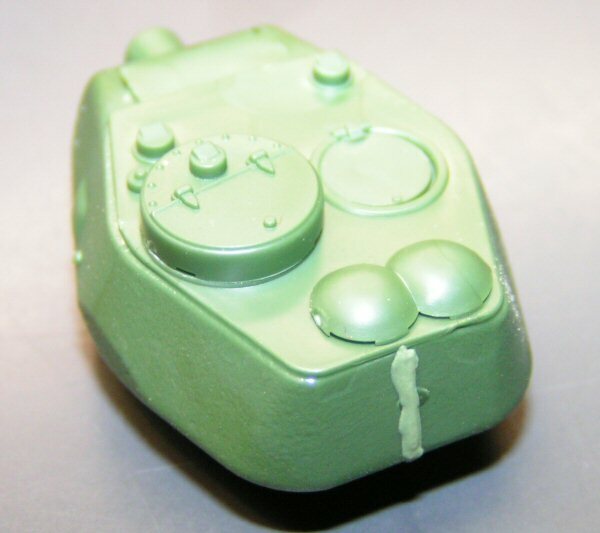 A light “dry-brushing” of both steel for coat #1 and a much-lightened green (base color 50/50 with flat white) for a coat #2 were used on the vehicle. Details were “touched up”, track was “dirtied up” with some Polly S “dirt” that I have, and then we were ready for the decals. This vehicle has seven (7) options for decals – all with the green paint scheme. I’m sure that you could also “winterize” you vehicle with some white paint and still use some of the decals provided. Two or three of the provided decal options are stated to be “winter/spring” versions. 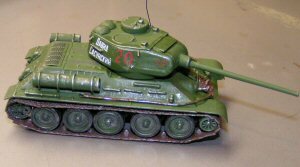 Since tanks, even Russian tanks with large slogans, don’t have too many decals, I used the last option in the directions, for red “20” along with a “patriotic slogan” (that I can’t read – but it looked “cool”) as my choice. [Ed: The slogan is "David Sasunskij" who was an Armenian hero that fought off the Persian invasion centuries ago.] Decals were only available for the turret. All decals went on well, into a small puddle of Future clear gloss acrylic, with the excess blotted up. After they are dry, I washed the excess glue off, dried the vehicle, and then gave a coat of flat to blend in everything. Overall construction time took about 25 hours. This was spread over the course of about 6 to 8 weeks. I was a little apprehensive over the “gum elastic” tires, but now that I’ve completed one, it doesn’t seem to be much different than using plastic other than you need to use either a super glue or epoxy to fasten tracks to them. I do wonder how the vinyl will hold up to years of display. I have some old vinyl track that have disintegrated over the years. As a general statement, the kit “looks” like a T-34/85 and seems to scale out fairly close to published data. 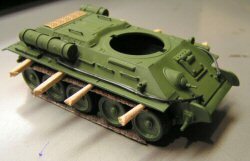 The kit has very fine detailing, went together very easily and will be a wonderful addition to your 1:72nd “tank corps”. I would recommend this kit to all who like to build “small” (1:72nd) kits and to those who have a few kits “under their belt” (because of the track assembly and photo-etch parts). 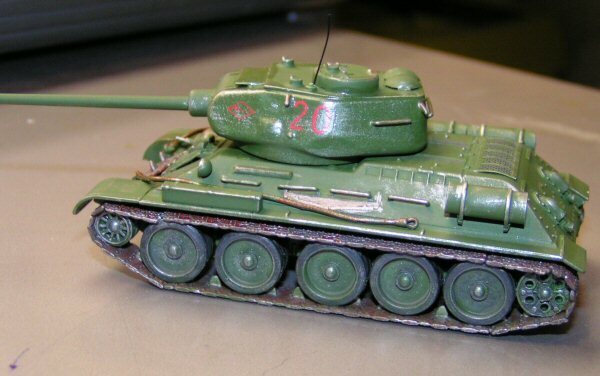 Diorama possibilities are seemingly endless for a T-34/85. I would like to thank Squadron Mail Order for the sample kit.